Part 1 of a two part blog on the big aurora display of 7th November 2017. ‘It’s not easy being green,’ opined that insightful philosopher and observer of life, Kermit the Frog. Sometimes misunderstood, often at the receiving end of criticism and complaint, and having the burdensome joy of that on-off love affair with the incorrigible Ms Piggy. Yeah, he had it tough. Not that I would want to compare my challenges with such a degree of hardship, but sometimes it’s not easy chasing green - especially if you live in Northern Ireland. Cloud hiding a great display, rain keeping us from heading out, weather a constant challenge. Add in the fact that, as we are currently in solar minimum, there just seems to be less activity going on for us to chase, even when the weather plays ball. In fact, the last major display that I had seen, complete with vivid dancing rays that went well up into the sky, was March 2016 (the Mother’s Day aurora). The dance of the night sky was increasingly becoming a distant memory, gathering dust in the corners of my mind. So, with the chance of an aurora on Tuesday 7th November and with clear skies being forecast, it was more with hope than expectation that I set out on the chase once more. The batteries were charged, the memory cards cleared, the geared packed, and off I went. Little did I know that, before the night was out, I’d be seeing auroral blobs, waves rippling across the auroral arc, and the best and most dynamic pillar display I’d seen in 18 months. Enough, no less, to prompt my famous (and as yet unobserved by any other human) aurora jig, in the cover of darkness, whilst the sky froliced above me! I’m going to break this blog into two parts: the first will map the aurora display across to the data that was coming in from the satellites and magnetometers - forecasting the aurora, if you like. The second will take us through in much more detail the various structural and morphological features that were on display that night - observing the aurora. For this, we’ll use my usual three questions. Coronal holes are cooler areas of the Sun’s surface which have open magnetic field lines. This allows plasma from the Sun to escape out into the Solar System, enhancing the solar wind and producing what is known as a Coronal Hole High Speed Stream (CH HSS). This takes typically 3 days to reach the Earth and, when it does so, it may produce more enhanced auroral activity here. Satellite images showed this region had rotated into a geo-effective position (i.e. it was pointing towards the Earth) and a fast stream of charged solar plasma was headed for us. That meant that activity was possible on Tuesday night - enough to get me planning for heading out, anyway. Whether the CH HSS actually brings enhanced aurora depends on the characteristics of the solar wind as is arrives at the Earth. The ACE satellite data that was coming in during the daylight hours of the 7th was hopeful. As the CH HSS approaches, ahead of it is what is called a CIR (Corotating Interaction Region). You can think of a CIR as being like the bow wave of an approaching ship. As the HSS speeds through space, it pushes into the slower ambient solar wind, causing it to gather up like a ship’s bow wave. This causes an increase in density of the solar wind as the HSS arrives; then, with the arrival of the HSS itself, the density drops again and the speed picks up. The ACE satellite data was revealing that the CIR seemed to be here. The density had gone up to 10/cm3 and the speed was not yet elevated much (sitting around ambient levels of around 400 km/s). And, as we moved into the late afternoon, the density dropped and the speed started to climb up to around 500 km/s. It looked like the HSS had arrived, and that something big was about to slam into our atmosphere and stir things up enough that we might get some aurora. But the magnitude alone is not enough. For good aurora activity in the mid-latitudes, we need the magnetic orientation of the solar wind to be aligned in such a way that it allows the aurora to travel further south. Again, the ACE satellite data looked hopeful. 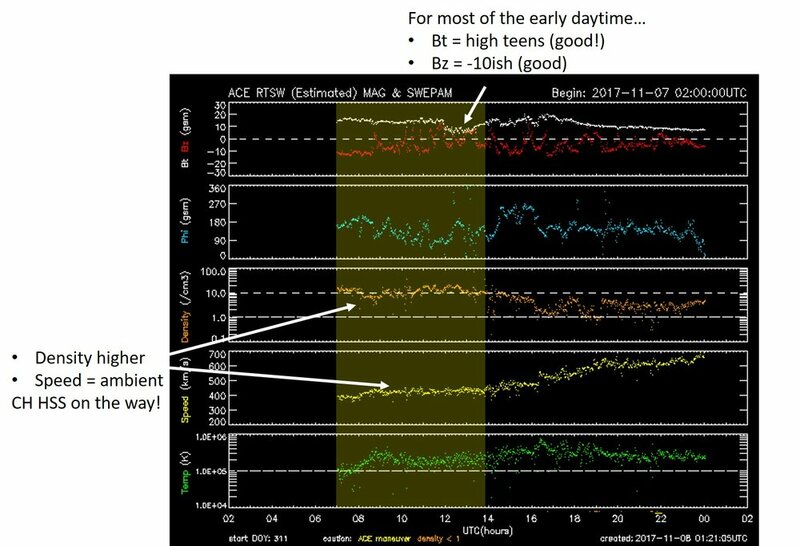 The Bt (a measure of the strength of the magnetism of the solar wind) was sitting in the high teens - a good level for the mid-latitudes. As the CIR approaches, the Bt often increases, before decreasing as the HSS arrives. Even more significantly, the Bz (a measure of the orientation of the magnetism of the solar wind) had been mostly negative - this allows the auroral oval to move further equatorwards, increasing our chances of seeing the aurora in the UK. The Bt acts as a cap on the Bz. The Bz numerical value, whether positive or negative, cannot be a greater number than the numerical value of the Bt. So, a higher Bt with a negative Bz is good for possibilities of sightings in the UK. This allowed me to say as we approached mid to late afternoon that there was a good probability of some action that night. In fact, having fallen a bit around midday, the Bt rose again slightly into the late afternoon - a good sign. And with the clear skies we were expecting, I was going out with a good level of expectation of at least some action. In the second part of the blog, I’ll cover in more detail what it was like observing the aurora, so this section will be shorter, but I’ll include some material for completeness’ sake. Once we’re out observing, the next set of data that we want to use are the magnetometers. Once we see the mags responding, we know that enhanced activity is likely very soon. When we look at these mags for the 7th November, we can see that there are two periods of greater activity, both corresponding to what we were observing across the UK. And what activity is was too, with many of the features of an aurora display that it’s possible to observe in the mid-latitudes actually being observed. In the next blog, I’ll do a field report of what I was seeing, matching it in closely to the magnetometer activity, and cover some of the main morphological forms the aurora can take for us here in the UK.